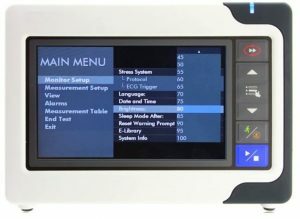 AZ Displays provides Medical Grade TFT LCD Solution for Blood Pressure Measurement Device | AZ Displays, Inc.
AZ Displays helped a leading medical device manufacturer design in an energy efficient 7.0″ LCD display for their blood pressure measurement unit. The ATM0700D38B, is an 800 x 480 RGB, 24-bit LCD that utilizes an integrated DC to DC converter on the FPC, allowing a user to interface to the graphics driver with only 40 pins as opposed to the traditional 50 pin set up for 7.0″ TTL modules. Many medical applications require sustainability and long product lifecycles. AZ Displays supports the medical application market by offering a reliable and stable product that can be supported for up to 7 years. AZ Displays also offers extensive value-add options, including optical bonding, strengthened cover glass, gaskets and sealants (to consider IP ratings and fluid ingress), silk printing, discrete touch buttons, and more. For more information on our standard product and value add services, please visit our website at www.AZDISPLAYS.com or contact the author below.